All orders placed before 3.00pm (Mon-Fri) will be despatched on the same working day. Orders placed on other days will be processed the next working day. We only accept orders from and for delivery within the United Kingdom. You can place an order through our site or contact us via email/phone. We accept all major credit and debit cards without adding on any surcharges. Payment will be made at time of ordering; your card will be debited once your order has been confirmed. If your item is not in stock, we will back order for you and you will always be emailed with the option to cancel your order and receive a full refund if you would rather not wait. All of our prices are inclusive of VAT. 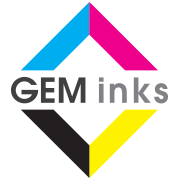 All products sold by GEM Inks are guaranteed 100%. We offer a no quibble 12-month guarantee on ink cartridges (6 months for remanufactured or reconditioned units). A copy of our certificate is available at your request.